This September 20, we will once again commemorate the Software Freedom Day (SFD). Established in 2004, SFD is an annual worldwide celebration of free/open-source software with a main aspiration of educating the general public the many benefits of using FOSS. 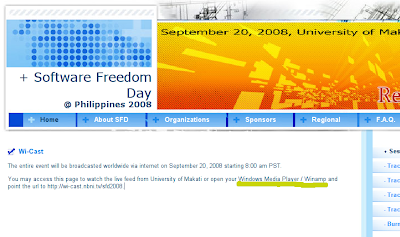 Join us in celebrating Software Freedom Day 2008 at the University of Makati. Desktop users, geeks, programmers, NGOs and even internet shops have laid out a coordinated celebration of free and open source software (FOSS) on September 20, 2008. With simultaneous events from Luzon to Mindanao, open source enthusiasts will meet and hold seminars and trainings on the use and promotion of FOSS. In Makati, there will be a discussion on what is open source software, its use in everyday computing and the Open Source Bill filed by Bayan Muna Rep. Teddy Casino in Congress. Breakout sessions will be held in parallel in the afternoon on varied topics such as FOSS for education, for NGOs and advocacy organizations, for developers as well as FOSS for internet cafes and small business. They should have at least suggested a free and open-source software alternative to Windows Media Player and Winamp. Anyway, mark your calendar already and see you at SFD 2008! and ow, it's a saturday... maybe i'll come, just maybe.